EncryptPad is a simple, free and open source text editor that encrypts saved text files and allows protecting them with passwords, key files, or both. It's available on Windows, macOS, and Linux. 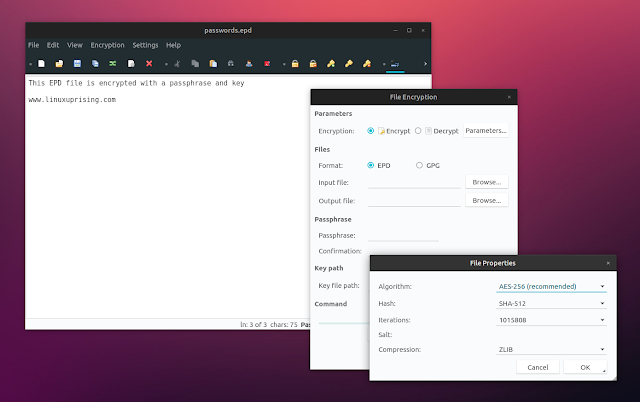 The application comes with a GUI as well as a command line interface, and it also offers a tool for encrypting and decrypting binary files. The secure text editor and file encryption tool is great for cases in which you want to prevent others from accessing sensitive information, be it some text (encrypt notes, credit card information, login credentials, a diary, or anything else you may want to keep secret and secure) or a video, photo, archive or other binary files, which is stored locally, placed on some unprotected media like an USB stick, or sent online, as an email attachment for example. Encryptpad can also serve as an alternative to a password manager. The application doesn't offer any advanced text editing tools, but that's because advanced text editing is not its purpose. EncryptPad is more or less designed to be a secure / encrypted Microsoft Notepad alternative that runs on multiple platforms. Or, to put it differently, it's designed to be easy to use and secure, without overcomplicating things. For Linux you'll find an AppImage binary, or you can check out this page about installing EncryptPad (includes Arch Linux AUR and Ubuntu / Linux Mint PPA packages).